Dr. Nathan Walworth (PhD) is an entrepreneurial climate scientist and futurist whose work lies at the intersection of global change, behavioral science, culture, exponential technologies, and the earth microbiome. He has broad experience in future-facing content creation and moderating cross-disciplinary technology panels. He speaks and co-produces cultural, environmental, and futurism content for various domestic and international summits and festivals including events at the United Nations, United States Institute of Peace, Lightning in a Bottle, Wonderfruit Festival, and more. His research has taken him from the Tropics to Antarctica with positions at various international institutions including the J. Craig Venter Institute (The first human genome), Lund University (Sweden), and the University of Southern California (Los Angeles), among others. He is also a Global People’s Fellow and Co-founder of several entities including CôVALENCE, Ocean SOS, and the NEXUS Futurism Lab: a platform designed to convene leaders across industry to highlight and drive social impact in rapidly advancing, emerging technologies. Michel Valenzuela began his career in digital advertising, founded a boutique agency in 1999, building a client list of companies such as Adidas, GM, Nike, VW, and DIRECTV. In 2007, Michel moved to New York producing work for clients such as Macy*s, TGIFriday’s, Aflac, HP & Microsoft, and worked with agencies such as Publicis, Havas, Dentsu, DDB, and Deutsch. In 2012 he relocated to Tokyo working as a technology strategist/consultant offering his expertise to both Fortune 500 companies and local tech-startups in Japan. Some of the more notable companies Michel has worked with in Tokyo are Google, Tinder, Bottega Veneta, and John Varvatos. In 2014 Michel created an art application that uses computer-vision (image recognition) to identify artworks using your phone’s camera in museums, art fairs and galleries; essentially a “Shazam or Art.” Michel began to explore other disruptive technologies beyond IR/AR such as blockchain and ML. Part of his day-to-day consists of co-operating a 50 person data company which has the largest blockchain database in the world. Michel has worked as an advisory consultant for dozens of blockchain companies providing guidance regarding product development, growth & marketing, and technology implementation. Michel also runs a small B2B marketing and social media agency where each team member has over 20 years of experience in digital advertising & business growth. The rest of his time is focused on exercising his passion for art, hoping to bring “the human side of art” by way of another (stealthy) art+tech project he’s heading. Truly passionate about the human experience, Tarun Raj has worked with some of the world’s biggest minds and brands to create impact. Using interactive technologies and immersive storytelling, he curates culture to address problems facing society. Tarun has a Masters in motion graphic design from the Savannah College of Art and Design and is the founder of FWD Future agency, a commercial advertising and technology company which designs solutions for the most innovative brands and causes. Fun fact: Tarun actually has 2 master degrees! He is also a reiki master and has been practicing for over a decade. It helps him and millions of other people solve the problems within to show up more powerfully for the missions they serve. 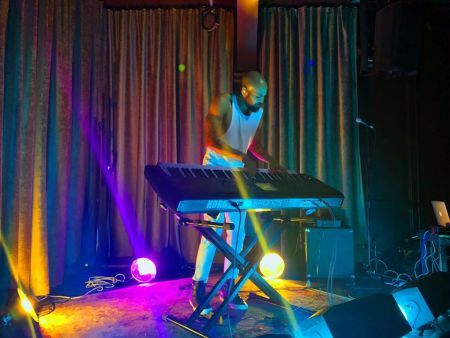 Charles is a performing artist who has a talent for bringing life, excitement, and value to every moment of every performance, while connecting with the audience and using music energy as the ultimate form of expression. Having his first tour with Justin Timberlake, to then going on to share the stage with the biggest names in music such as Rihanna, John Mayer, Backstreet Boys, Ciara, Demi Lovato, Estelle, and one of the most famed shows on earth The Michael Jackson Immortal Tour (Cirque Du Soleil). At Radiant Space, we believe art makes a difference. We believe in giving a voice to artists and human beings who may not be heard, yet have a lot to say. We pride ourselves in giving back to our community and in raising funds to help the larger environmental issues impacting our planet. We strive to find artists of diversity to create an ever-changing space for the return audience to be mesmerized by the transformation on every visit. We are an open container for like-minded individuals to bring their ideas to fruition. We create events that allow the public to interact with art on a personal level, whether it be through a sound bath, a music show or an artist talk. Change happens through dialogue, and we hold space for conversations to drive impact.